Las Vegas oddsmakers aren't giving 12-0 Notre Dame much of a chance to beat Clemson in the semifinals of the College Football Playoffs but bettors aren't scared of the 13-point spread on the Irish and are betting them to win outright. Las Vegas oddsmakers aren't giving 12-0 Notre Dame much of a chance to beat Clemson in the semifinals of the College Football Playoffs. 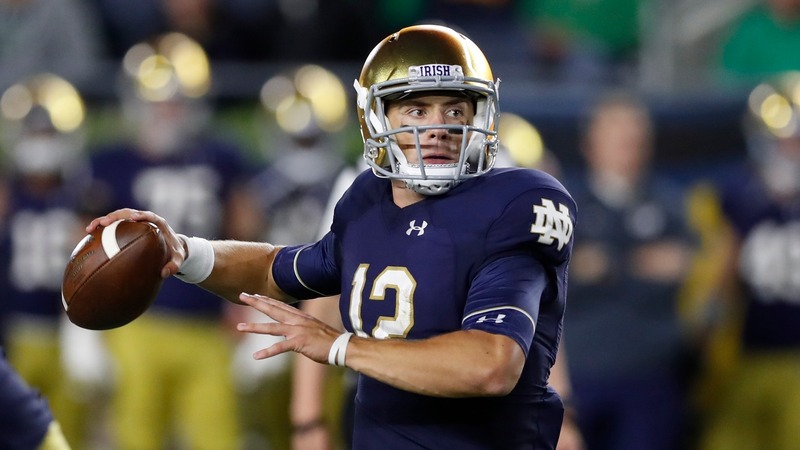 The [Fighting Irish are 13-point spread underdogs](https://www.betchicago.com/cfp-2019-odds-betting-lines-notre-dame-underdog-clemson) and +375 on the moneyline ($100 wins $375 for a total payout of $475) to pull the upset and advance to the finals. Despite the steep odds at the Westgate LV SuperBook in Las Vegas, bettors aren't scared to back the Irish (7-4-1 ATS) outright against a Tigers defense that has been beaten at times through the air this season. Westgate oddsmaker Ed Salmons told BetChicago that "public bettors are all over Notre Dame" leading up to the Cotton Bowl on Dec. 29. __Play and win:__ [Join our free contests](https://betchicago.chalkline.com/) "We’ve had professional money come in on Clemson (7-6 ATS) two times already (at -11.5 and -12)," Salmons said. "But the public loves Notre Dame." Texas A&M's Kellen Mond and South Carolina's Jake Bentley each threw for over 400 yards against the Tigers and Irish QB Ian Book ranks eighth in the country in passer rating (162.5) and 10th in yards per attempt (8.8). Book should have opportunities to make plays against a Tigers pass defense that allows 12 yards per completion. "I think if there is going to be an upset I think this is the spot," John Avello, former oddsmaker at The Wynn and now Director of Operations at DraftKings told BetChicago. "If you want to look at power ratings, Notre Dame doesn’t belong but they have been in the underdog role before and they like it. I think they will perform well in it." __MORE:__ [Finding the best College Football Playoff futures at various sportsbooks](https://www.betchicago.com/odds-shopping-college-football-playoff-futures) In the other semifinal of the College Football Playoffs, the Westgate took sharp money on UNDER 80 for the Orange Bowl matchup between No. 4 Oklahoma and No. 1 Alabama despite the Sooners' leaky defense that allowed 40 points against lowly Kansas earlier this season. The sharp action moved the total from 80 to 77.5 on Friday morning. "Their goal in life is to bet every big total UNDER," Salmons said. "That’s just what they do -- we saw it in the Chiefs-Rams game and that wasn't even close (54-51 final)." The Westgate is seeing solid two-way action on both semifinal games but Salmons said the sportsbook doesn't want to move off Alabama -14. __Also read:__ [Latest 2019 Heisman odds](https://www.betchicago.com/2019-heisman-odds-tua-tagovailoa-trevor-lawrence-jake-fromm) "We have had a couple of (sharp) groups take OU +14 and there is plenty of Alabama money," Salmons said. "Both semifinal games have an amazing amount of two-way action but we're still high on both dogs on the moneyline." Avello said if Alabama and Clemson meet in the title game he would make the point spread Alabama -8. "If things don’t go according to plan and either team has a close game it could be less and opposite on the other side," he said.